I found this non-working Heathkit H-19A terminal in the garbage bin at my collage years ago. I finally felt like doing something with it. The thing turned on and had a blinking cursor so I knew that all the CUP and display circuitry was working, but there was nothing on the serial data lines when I tried to type something. First step was to find some information on the device. I found the schematic on line and started to trouble shoot. I found that the -5V and -12V supplies were outputting nothing. There was voltage going in to the 7912 negative voltage regulator, but nothing on the output, and it was very hot. 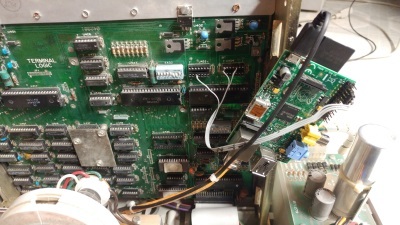 The 7905 was fed from the 7912 so there was no input or output from that device. I thought it was a simple case of a broken 7912 so I removed it and bench tested it. I found it to be working correctly. So the problem had to be somewhere else on the board. Ohming out the -12V rail to ground showed a short. 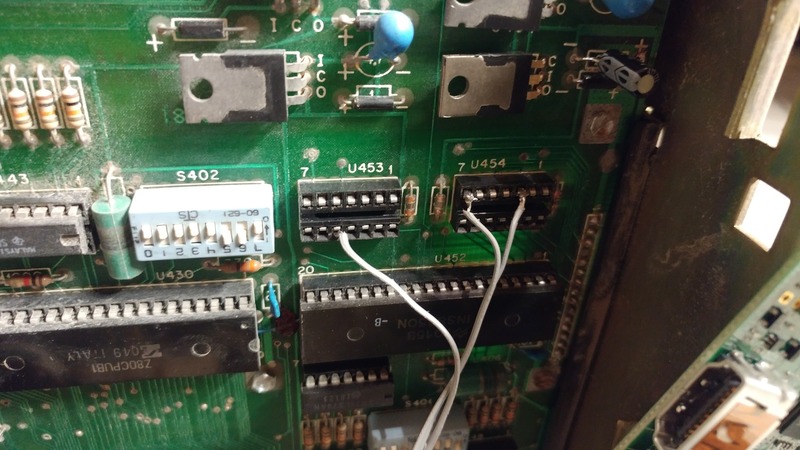 This is not a fun problem to solve since the -12V rail is connected to a number of parts and any one of them could be causing the short. I decided to start by removing the easy parts first. I removed the filter capacitor on the output of the 7912. This turned out to be the short. I was happy it was the first part I removed and was an easy part to replace. Once a new capacitor was installed and the 7912 soldered back in place, the terminal was echoing characters but still not outputting data. The H-19A has an off-line key that allows you to echo characters locally and not send any data out. I suspected it was in off-line mode. I tried toggling the key numerous time but it didn't change anything. After prying off the keycap for the off-line key I found that the contact parts in the switch were broken and bent leading to the terminal being stuck in off-line mode. I simply cleaned out the broken parts and separated the contacts to leave the switch in on-line mode. I will be using the device in on-line mode most of the time so I just left it like this for now. I might replace the switch at some point, but not now. With the Heathkit in on-line mode I was getting the expected data out of the serial port. I wanted to make this thing somewhat useful or at least fun to use. 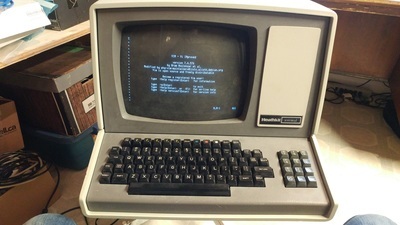 I don't have a Heathkit H89 computer to hookup to it and I didn't feel like buying one. 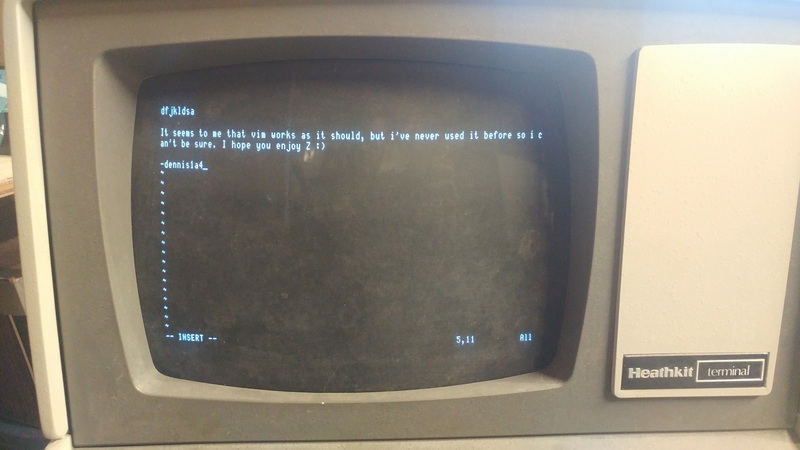 I decided to connect it to a Raspberry Pi. The voltage levels out of the Heathkit serial port are proper +/-12V. The Raspberry Pi would not be happy with these voltages. I had the idea of using a serial voltage converted chip (like a MAX232) to move the voltages to TTL levels but that would add extra parts and time and I wanted this to be a simple project. I found that the data from the CPU to the serial driving chips was around 3V. The simple solution was to remove the serial driving chips and hook the Raspberry Pi directly to the CPU. Luckily al the chip are in sockets to this was very easy to do. The H-19A has the capacity for hardware handshaking but uses software handshaking. Once I had the Pi serial port enabled and setup for 9600 baud everything seemed to work. 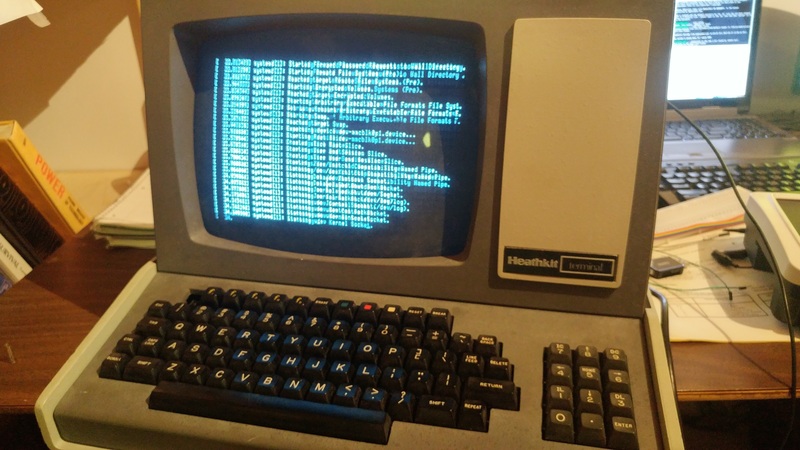 I could boot up the Pi and watch the boot process on the Heathkit. But every once and a while it seemed to hang and would miss some data. 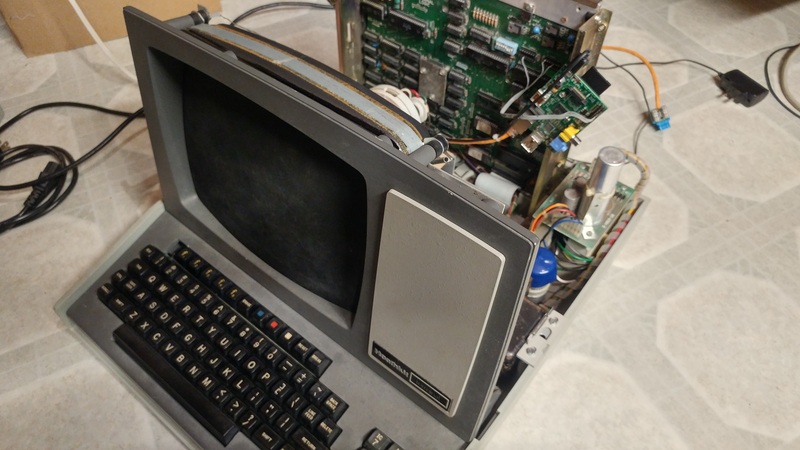 After trying slower baud rates and other small tweaks I found that the problem was with a Heathkit option. You can set the Heathkit to use the Heathkit escape sequences or the ANSI escape sequences. Switching to the ANSI escape sequences fixed the problem. With everything working I install the Lynx text based browser and played around. 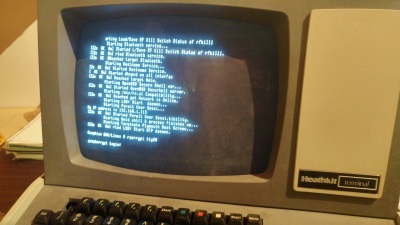 It is fun to surf the internet on a terminal that was never really designed for such a thing. With the software side complete I drilled and tapped a couple of holes in the Heathkit to mount the Pi inside of it. I ran a network extension cable and power adapter thru one of the vents in the bottom of the device to keep a somewhat clean look. After putting the case back on I spent maybe an hour messing around before turning it off and putting it on the shelf where it will probably stay for a while. 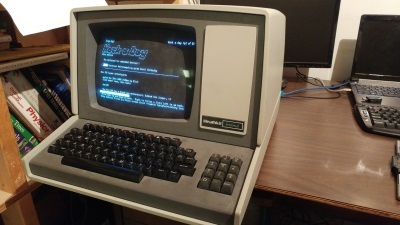 I think at some point I might install a Heathkit H89 (or PDP-11) emulator on the Pi and use the Heathkit how it was original intended to be used, but for now it�s mostly a decorative piece in my office.